NMDnet is an experiment in creating a “meta-network” of social networks. It was launched to help unite in a single conversation the University of Maine’s New Media Department, including students, faculty, alumni, and other thinkers. The NMD community is increasingly dispersed across different networks, with undergraduates on Facebook, alumni on Twitter, and everyone in between getting their news via blogs, email, and the Web. NMDnet exploits cross-network protocols to allow users to check news in any of these platforms and for their comments to re-appear on a centralized blog even if they come from Twitter or Facebook. NMDnet is a project of the University of Maine’s Still Water lab. Download a pdf summary of how NMDnet works, or read the instructions below. To read NMDnet on Facebook, visit the New Media Department Facebook page and become a fan. You should then see NMDnet posts on in your News Feed. 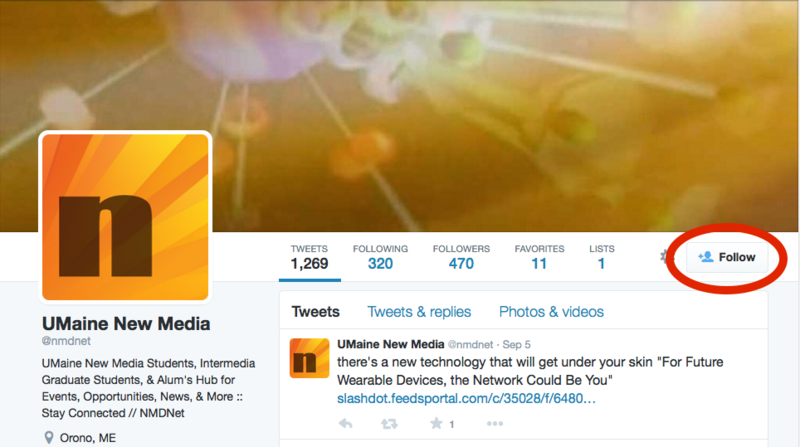 At Twitter.com or in your Twitter client, simply search for the nmdnet user, and click on Follow. Sign up for a news reader of your choice, such as Google Reader for the Web or NetNewsWire for your phone. News stories and new media developments from outside of the department. Live happenings in the NMD community. NMD members seeking or offering opportunities, from jobs to exhibitions to collaborators. Help and advice about software, hardware, and other technical matters. Rants, raves, and reviews. Note that these are netcast publicly–choose your words carefully! 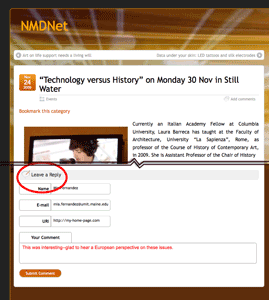 Although you can also post using the blog interface, NMDnet offers an easy way to forward or post information to the blog directly from your email. You can simply punctuate your email as you would normally, and it will show up that way on the blog. Optionally, you can use special syntax for indicating an excerpt, embedded image (attached to the email), caption, or descriptive tags. :excerptstartSeeking video students to work on documentary film:excerptend#img1# Our Boston-based video production company, Supercinema, is looking for a motivated filmmaking student to work this summer on a documentary about the slow food movement in the United States. Interested candidates will learn more at http://supercinema-video.com. We are accepting applications through March. More about the post-by-email syntax. The subject of your email will be tweeted out via NMDnet, along with a link back to the blog. The subject and an excerpt of your email will appear on the New Media Department Notes and on its fans’ Walls. Just click on a story headline and use the comment box at bottom. Simply reply to an NMDnet tweet, and your reply will re-appear back on the blog as a comment. Simply add a comment to an NMDnet post on your wall, and your reply will re-appear back on the blog as a comment. Comments are currently moderated, but once you are admitted to the system they should be accepted almost immediately. You can add a video, such as YouTube, to your post just by adding its url in your email. If you want to more options for audio or video, you can use a WordPress shortcode. NMDnet is still in beta, so please let us know if you encounter any bugs or if you have any suggestions. Background image based on John Klima’s Glasbead, used with permission. WordPress theme based on Suffusion. Keith Frank on Has the recording industry given up eradicating music piracy? James Mehorter on Has the recording industry given up eradicating music piracy? Nathaniel Stern on Has the recording industry given up eradicating music piracy? Has the recording industry given up eradicating music piracy?